The MSO-9201 Mixed Signal Oscilloscope combines the features of a digital oscilloscope and a logic analyzer in an integrated, easy-to-use package. The instrument offers 500 MSa/s for single shot sampling and 20 GSa/s for repetitive signals. The MSO-9201 has 14 channels: 2 digital storage oscilloscope channels and 12 logic analyzer channels . All channels are fully synchronized and can each store up to 512 Kpt. The MSO-9201 has advanced triggering with options, such as: Rising/Falling edge, pulse width and count, 12 bit Logic, I2C and SPI. The scope is portable and connects to a PC via USB. The advantage of an MSO is having time-aligned analog and digital inputs displayed on the same screen, so having one instrument is more powerful than two separate instruments. Gain more insight into your circuits. All 14 channels are sampled simultaneously and displayed together. Analog and digital waveforms are acquired with the same sample clock to assure accurate time correlation between the two. Even by cabling two individual instruments together, one would still not be able to obtain samples within 2 ns of each other, and the triggering would not be as tightly coupled as with a single unit. The Logic Analyzer display can show individual pulse-width and frequency information. Fast 500 MSa/s ADCs allow the MSO-9201 to acquire and resolve events as narrow as 1 ns. The MSO can simultaneously sample at 500 MSa/S (2 ns) across all 14 inputs (2 DSO+12LA). 20 GSa/s (50 pS) sampling resolution is available in RIS (Random Interleave Sampling) mode. On the opposite end of the timebase spectrum, the MSO can sample at 1 Sa/S, which equates to 524,288 seconds, over 145 hours, or 6 days per acquisition. The MSO-9201 has an external clock input that is primarily used when doing logic analysis, but is also useful when doing mixed signal analysis or even pure DSO work. With an analog bandwidth of 200 MHz and 20 GSa/s, the MSO-9201 is the new performance leader in its price range. By fully utilizing high-speed USB communications and size-changeable acquisition buffers, the MSO-9201 can be adjusted to provide fast screen updates and a very responsive analog oscilloscope-like experience. The MSO-9201wLA also has an external clock input that is primarily used when doing logic analysis, but is also useful when doing mixed signal analysis or even pure DSO work. A vast amount of data can be captured in the large acquisition buffer. The 512 Kpt buffer allows for high-speed samples and captures of long traces. Other instruments with short memory buffers force you to degrade your sample rate and thus lower your bandwidth. For example, if you needed to capture a 100 us event using a 500 MSa/s scope with a 2.5k buffer, you would reduce your sample rate to 20 MSa/s, or at best a bandwidth of 5 MHz! The MSO-9201 would let you view that 100 us event at 5 GSa/s. There are often many points of interests that are scattered throughout the buffer. QuadVue provides four independent timing windows that allow users to view the entire buffer while simultaneously focusing on details, so there is no need to constantly pan and zoom. For quick analysis, one can superimpose the current data over the mathematically operated and the history memory data. In this example four timing windows are being displayed: Window 1 shows the entire buffer. Window 2 shows a zoomed in section around the trigger (red cursor) event. Windows 3 and 4 show a unique part of the waveform and are zoomed differently. The dual channel FFT has controls for FFT windows, FFT types, FFT resolutions, frequency range filters, peak holds, and Min/max envelopes. FFT data can be saved to a disk and exported to other programs such as Excel, Mathcad, etc. A powerful suite of over 40 measurements is available. The measurements can be performed on an incoming waveform, a stored waveform or a mathematically processed waveform. The data cursors can be used to define a subset of data to be measured. The MSO-9201wLA can display and decode SPI bus protocols as well as trigger on them. Up to 3 SPI buses can be decoded simultaneously. 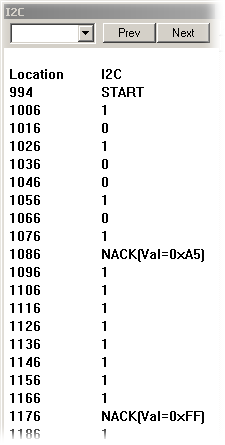 SPI decode window. The MSO-9201wLA can display and decode I2C serial bus protocols as well as trigger on them. I2C signals can also be viewed as timing waveforms or in a statelist-style display. To save time, waveforms can be automatically datalogged to a PC. Data can be stored after each capture or according to the results of pulse measurements. All high-speed acquisition is done with the MSO hardware; the speed of a PC is not a factor. The PC is simply used for display and for the user interface. If a PC is fast enough and has enough memory to run Windows well, it will also run our products well. The instrument has high-speed samplers and buffers. It can acquire information at up to 1 GSa/s and stores the data in its own 2 MegaSample data buffers. When these buffers are full, the data is transferred to the PC. The Oscilloscope can automatically save and display up to 30 previous captures. Each capture will be color-coded and the oldest ones will fade away. The MSO-9201 can trigger on a signal in either the digital or analog domain. In the analog domain, triggering can be done using a rising or falling edge. Other analog domain triggering features are pulse width and pulse count. One of the benefits of pulse width triggering is that it can detect glitches. Digital domain triggering can use either a 12-bit wide digital word or the advanced serial trigger (I2C and SPI bus protocols). Two 300 MHz 1x/10x switchable probes, LA wire harness and 16 LA clips are included. Two 300 MHz 1x/10x switchable probes. Main unit: 7.9" x 4.7" x 1.5"